This National Trust Ickworth Summerhouse has recently been installed in our customer’s country garden in Langridge, Somerset. The customer had a National Trust Blickling Garden Shed installed in their garden (directly behind the summerhouse in this photograph) around a month before this installation, so they now have matching buildings from the National Trust Range, both the same colour; National Trust paint system in Wades Lantern. As with all the National Trust Garden Buildings, there is a black corrugated material on the roof of the building, the boards for the cladding have been sawn vertically, and the windows and door furniture is made of cast iron. This door furniture on the National Trust summerhouses is designed to be more intricate than the garden shed door furniture, as it has been made in the style of the Fleur-de-Leys. 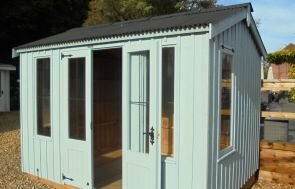 Our National Trust Range of Garden Buildings come in two varieties: National Trust Summerhouses and National Trust Sheds. These buildings are most suited if you require a traditional feel. We have Seven UK Show Centres open to the public for browsing. Here we display an array of Garden Buildings, helping you to source the perfect model for your garden. Need any guidance with your own Garden Building? If so, please Request a Callback, Contact Us or call us on 01760 444229 to speak directly with one of our expert team.